This week’s Culture Crime News was expertly compiled by Ryan Casey. Egyptian antiquities are going up for sale at a Sotheby’s auction, so the Antiquities Minister is carefully monitoring the provenance of the objects. A young woman and her grandfather discover a vast and valuable collection of Nazi-looted art that was taken from her grandfather’s family in Austria. Six carvings by John Sabourin and Derrald Taylor were stolen from an art studio in Yellowknife. The responsible party cut through a padlock to break into the building. Griffin’s raven statue was mysteriously returned to his Ottawa studio overnight, with the addition of a Sharpie-drawn eye by the thief. A group of Sudbury locals are utilizing Facebook and social media to track down a painting by A.Y. Jackson that went missing from a local school in 1974. However, a local art gallery director believes it will lead to over-heightened security measures for other works of art in the town. After the death of an art collector in Toronto, paintings from his house mysteriously disappeared. Cuban authorities see the influx of tourism and foreigners as the cause for increased trafficking of Cuban cultural heritage. Despite the federal laws in place to protect cultural heritage sites, an average of 26 churches are robbed every week according to the Catholic Media Center. Although there are laws and reporting organisations in place to monitor and enforce the protection of cultural objects in Mexico, the lack of interagency cooperation and investigation resources hinders punishment for such thefts. A crowd of villagers prevented a man from stealing a gold medal worn by the Virgin Mary. When assessing the archaeology of the Pipeline route, Native Americans were not adequately consulted. While the Strong Heart Society Staff area remained mostly intact, others might not be so lucky. The Newark Museum is exploring new ways to present Native American art, in an effort to challenge colonialist assumptions about time, space, and tradition. A former employee of the Intrepid Museum made threats against the museum’s security team in a YouTube video. Someone walked off with Pako Pablos’ painting of Lebron James during the Beat Street San Diego Festival. Although a suspect has been arrested for the theft of the painting, the $5000 art piece has not yet been recovered. Although the bronze crown is not monetarily valuable, it is a very significant part of the church. A London auction house turned over an ancient Cyprian object after discovering it was looted from a private collection during the 1974 Turkish invasion of Cyprus. A theft from the Basilica of Saint Michael over thirty years ago is still being fought in France as diplomatic channels are being opened to negotiate the repatriation of seven sculpture back to Bordeaux. The Ferdinand Möller Foundation has withdrawn its funding at Berlin’s Free University to research Nazi-looted artwork. The German government has stepped in to fund the continuation of the research. After Bouvier fraudulently sold Rybolovlev a da Vinci painting for above-market price, Sotheby’s has found itself involved in the criminal and civil cases for facilitating a transaction involving the painting years before. After analysing the glue used to hold the tiles to the skull, it was discovered that the skull was more modern than the Leiden Museum of Ethnology originally thought. Should we appreciate the fakes of Van Meegeren for what they are and what people thought they were? The painting was stolen in a break-in in Krakow in 1997 and recently recovered by police in Warsaw. The lack of will and compliance to conserve culturally important sites in Spain is to blame for the slow destruction of cultural heritage. Los Altos de San Gregorio, an ancient indigenous village in Gran Canaria, is closed to the public more often than not due to constant vandalism of the site despite its being declared an important Cultural Interest site. A distinctive 17th century plate and items of cutlery were stolen. A local graffiti tagger penned Ziggy has been defacing culturally and religiously important buildings around Kent. A Persian plate and utensils were stolen from the Polesden Lacey House, a National Trust property, in Surrey. Illegal metal detecting and digging near Worthing has damaged the grounds at Cissbury Ring. Approximately 80-100 pieces of Terry Bradley’s work has been stolen in Belfast during a raid of a gallery. A gallery in Belfast, exhibiting the work of Terry Bradley, was robbed. The thieves broke in through the back and got away in a van. Two art students at ANU had their artwork/coursework stolen during a graduate exhibition. Meyer and Brysac’s book on repatriation-related issues in the American market for Chinese cultural heritage is noticeably not being sold at the Metropolitan Museum of Art, only exemplifying the reluctance of American museums outlined in the book. A number of murals have been stolen from temples around the Shanxi province. At least a dozen frescoes were stolen from temples in the Shanxi province. The State Administration of Cultural Heritage is looking to step up protection of China’s cultural heritage. A convicted idol thief formed a specialised team of thieves while in prison and was soon arrested once again after a series of robberies. A dozen statues were stolen from the Adinath Nrana Digambar Jain temple. The George Katsutoshi Nakashima piece was stolen from the National Institute of Design. A man was arrested for the theft of Rabindranath Tagore’s Nobel Prize medal in 2004 from the Visva Bharati University’s museum. Indonesia will be working with the Netherlands to investigate the illegal scavenging of Dutch shipwrecks from World War II. Alongside the famous The Great Wave off Kanazawa, Hokusai’s recently recovered Sumidagawa Ryogan Keshiki Zukan (Landscape Scroll of Scenery at Both Banks of the Sumida River) is now on display at the new Hokusai Museum in Tokyo. The temple has confirmed that the theft was of 28 idols. 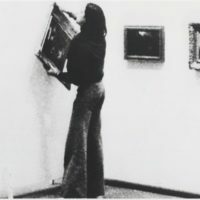 Both the forgers and credited artist, Lee Ufan, take credit for the paintings. Now that Iraqis can begin returning to Nimrud after it was destroyed by the Islamic State, archaeologists and the public must decide what to do and how with the remains of the ruins.